Fiction-Food Café: Flaming Fire Flakes from "Avatar: The Last Airbender"
Flaming Fire Flakes from "Avatar: The Last Airbender"
Along the lines of popcorn and nachos, flaming fire flakes are available in the Fire Nation and its territories at public events such as the Fire Days Festival in the Fire Nation Colonial Village (ATLA s.1, ep.16) and entertainment venues like the Ember Island Theater (ATLA s.3, ep.17). 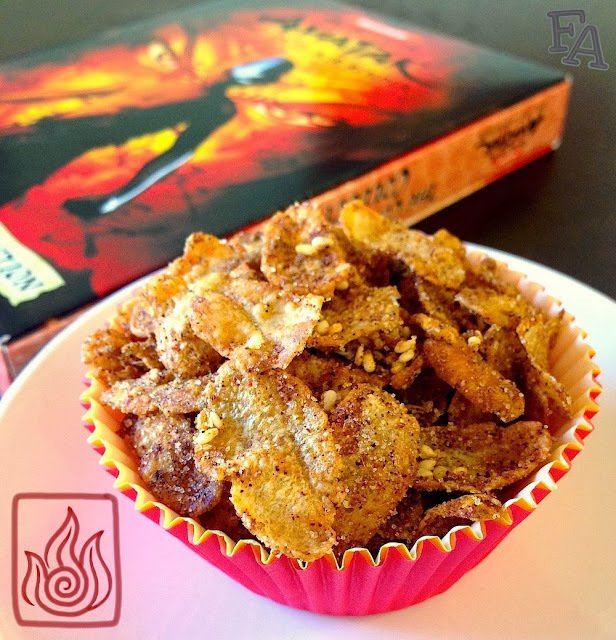 As per Fire Nation tastes, these flakes are seasoned with hot spices and served directly after roasting. 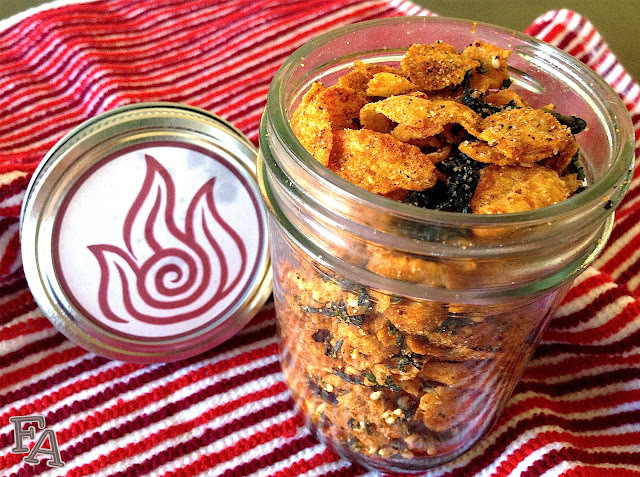 Suggestion: If you'd like to gift these awesome, spicy flakes to someone, or simply store them for yourself, pour the finished flakes into glass canning jars with 2 piece screw on lids (the ring & disc kind). 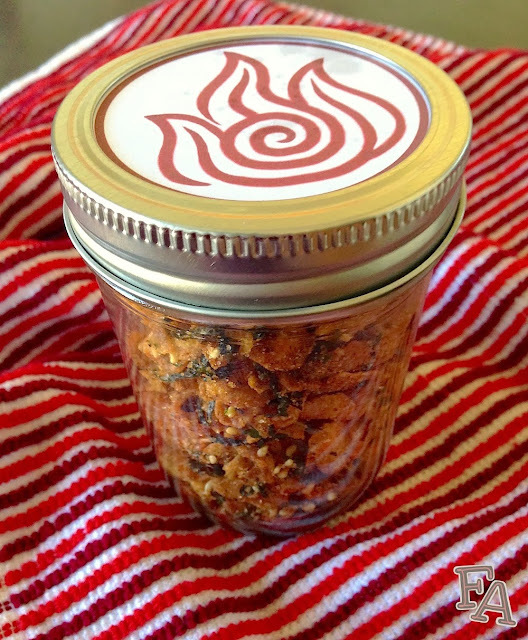 Print and cut out these Fire Nation symbols to place in between the lid pieces & there you go! 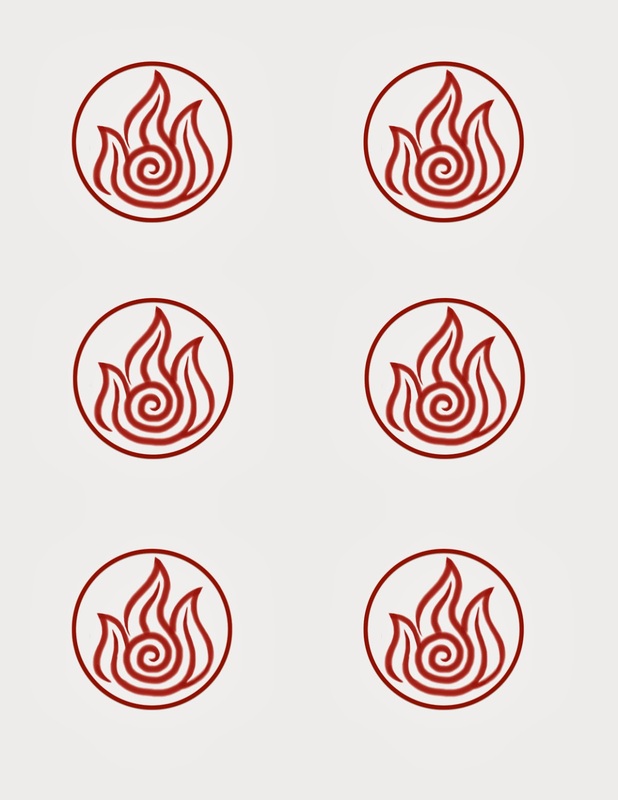 Click here for the Fire Nation symbol cut-outs. 1. Preheat your oven to 275 F. In a small bowl whisk together the 1st 4 ingredients until combined. Spice Note: Depending on how flaming you want your flakes, put either the 1/4 or 1/2 tsp. red pepper, or omit it all together if you're fine with taco seasoning level flames. 2. 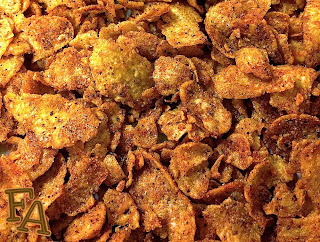 Pour the corn flakes into a large container with a lid & then pour on the sesame oil. Close the lid & toss well until the flakes are completely coated. 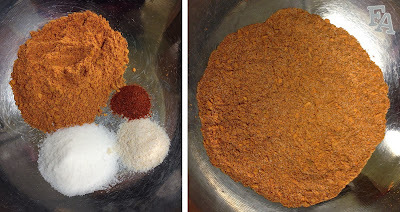 Add the mix of dry ingredients, close the lid, & toss again until the seasoning is distributed evenly throughout the flakes. 3. Line a tray with parchment paper & pour the seasoned flakes onto the tray. Spread the flakes out evenly & bake for about 15 minutes. Serve warm. Serving Suggestions: Add 1 Tbsp. sesame seeds (black or white, or both) to the seasoning mix for added flavor, texture, & color. 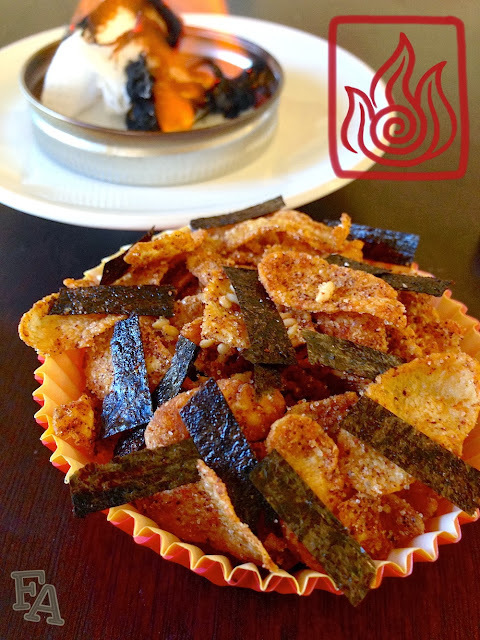 You could also mix the finished flakes with crumbled seaweed (especially if you can find kimchi flavored). It adds extra Asian flair & flavor, & the colors look really great together. Also, fire flakes are great as a snack but they're also great crushed & sprinkled on plain white rice! Haha, totally. 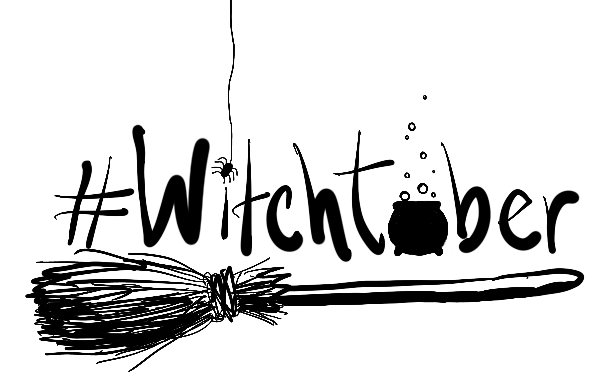 I've got several more scheduled for upcoming Friday posts. Fruit Pies is definitely one of them - I've got the ingredients sitting in my fridge. Sea prune stew, no, but I will be posting a recipe for Seaweed Noodles. 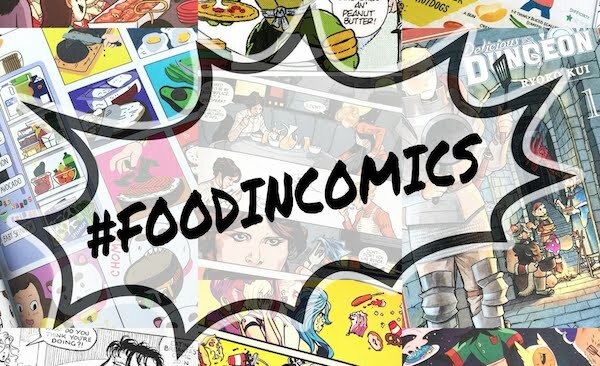 Also have a couple more Earth Kingdom foods coming up. 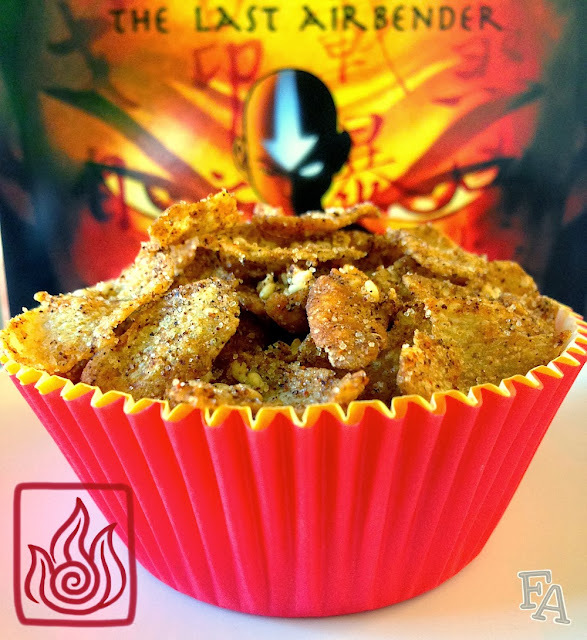 Stay tuned for another World of Avatar recipe tomorrow (Fri. 11/15)! great job! love these and already have more in the oven. 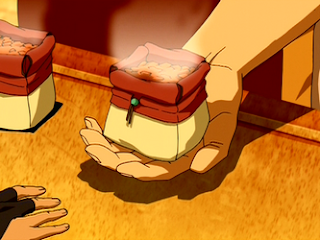 this is the best snack ever for watching avatar! Awesome! I'm glad you like them! I just made these and they are amazing! Thanks for the recipe!